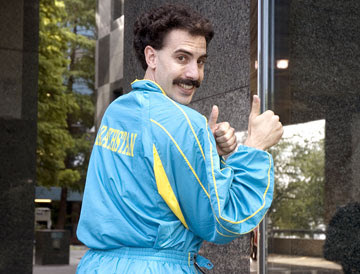 LONDON -- While Kazakhstan tabloid Karavan voted "Borat" best pic of the year, the Sacha Baron Cohen laffer is getting no love in the Mideast: "Borat" has been banned by censors in every Arab country except Lebanon. "Lebanon is the only country that's passed it. All the Gulf, and even Egypt, has refused to clear it," said Bassam Eid, theatrical director with Circuit Empire, which is repping pic's release in the region. It's the pic's gross-out humor that is proving troublesome for censors. "It's vile, gross and extremely ridiculous," said Yousuf Abdul Hamid, censor with Dubai's Ministry of Information. Several UAE censors reportedly walked out of the test screening in disgust. Hamid added that if all the offensive scenes -- such as the naked wrestling match -- were removed, all that would be left would be "a half-hour movie." To "Apocalypto" or Not to "Apocalypto?" Category Confusion for "The Departed"